Although this might be a bit late, I thought it may still be a good idea to present the following “public service announcement” to the American Medical Association. I do this because their endorsement of the Pelosi version of Obamacare was probably done in haste without a full opportunity to read the bill. 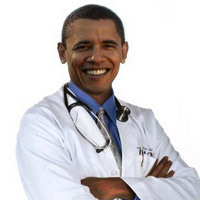 Rather than repeat that mistake with the as yet to be released Reid version of Obamacare, perhaps some doctor…anywhere will read what follows. Section 2401 (beginning at page 1322) of Pelosi’s Obamacare creates a Center for Quality Improvement under the leadership of the Director of the Agency for Healthcare Research and Quality. It’s mission, among other things, is to develop and implement best practices for quality improvement activities in delivery of health care services. This would be like the Mayor of the town of Podunk (i.e., Congress) telling the Town Council (i.e., the Director of the Agency for Healthcare Research) that it has the power to set speed limits (i.e., best practices) in the town. But, at the same time telling the citizens (i.e., the doctors) of Podunk that if they follow the speed limits set by the council it will not be a defense if they receive a speeding ticket. Not only is Congress intent upon preserving the law of unintended consequences, it is also intent upon preserving the law of absurd results. I did a post earlier this year entitled “The elephant in the room…tort reform”. After reading Pelosi’s version of Obamacare, I can say with confidence that not only is the elephant still in the room, it’s getting bigger. Funny, I would have thought that the Democrat controlled Congress would have first priority on a "Center for Quality Improvement". Forget best practices: just a simple understanding of the Constitution and the intent of the forefathers would be enough!